Two of the most popular types of residential home fences are wood and plastic. 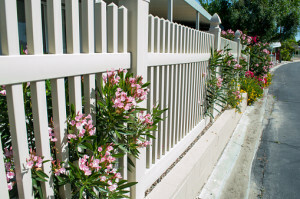 Both accomplish their basic tasks of serving as barriers—but there are some key differences that should play into your decision as to what type of fencing to get for your home. For example, wooden fencing has numerous styles and functional advantages over plastic. Strictly speaking, nothing. Plastic, PVC, or vinyl fences are solid prefabricated options for fencing. The trouble is that their downsides, when compared to wood, tilt the balance against them. For instance, plastic fences aren’t as strong as wooden ones. Direct impacts are much more likely to damage a plastic fence, which is an important consideration for homeowners with rambunctious children. Additionally, plastic pieces aren’t attached using nails or screws; they are “snapped” together. This means that over time they’re more likely to detach and develop weak spots. In addition, extreme temperatures (i.e. a brisk Canadian winter) can make plastic brittle and prone to cracks or breaks. Plastic fences are more expensive for two reasons: The first is that the material is naturally pricier, which can be a deterrent for trying to fence in large yards. The second concerns the way plastic fences are put together—you cannot easily replace single planks or pieces. Rather than swapping out a single board, you may be forced to replace an entire section. Wood is a traditional choice for fences for a reason. It offers a classic look, is affordable to install, and offers a great selection of customizable colour choices, paints, and stains. Among the many options wooden fences come in are picket, post-and-rail, basket weave, crossing slats, or vertical boards. Stenciling patterns can be used to further personalize the design, and wood blends much better with planters or gardens for enhanced appearance. Interestingly, wooden fences also get stronger with age. As the wood matures and sets into the ground, the stability of the fence will improve. This is in addition to its already impressive resistance to blows and impacts. The cost of a wooden fence largely depends on the type of wood, but in general it will be cheaper than a plastic counterpart. They are easier to customize for different sizes and shapes, enabling them to be both perimeter fences and interior partitions. Furthermore, repairs are simple and require little more than a hammer, a few nails, and a spare board. Total Fence Inc. has some of the top fencing contractors in the Greater Toronto Area. Our experts know the pros and cons of all fencing materials, including wood, metal, glass and plastic. Our experience and knowledge will help you make the best choice when choosing your residential home fence. Contact us at 416-239-5362 to speak with a consultant, learn more about how we can build you a wonderful fence or how you can get materials to make your own.